Happy First day of Spring, on behalf of the only Cub ever named Spring…. He pitched for seven teams in his eight big league seasons, and for exactly one month that team was the Cubs. 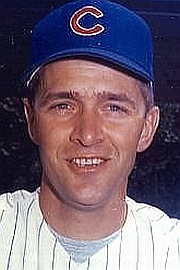 They acquired Jack in May of 1964, and he pitched in seven games over the next few weeks. But then on June 15, 1964, Spring was called into the manager’s office and told he had been traded again. This time he was the throw-in in the trade that sent Lou Brock to the Cardinals. In St. Louis, Spring won a ring (although he didn’t make the postseason roster that year). Not sure what happened to that Brock character. One of the most miraculous stats of Jack’s career is this little tidbit: He once went 19 consecutive outings without recording a strikeout. That’s the longest streak since 1957.